The Book of Lists is your resource to stay ahead of the competition. Get in-depth information on the largest and most influential businesses in East Tennessee. 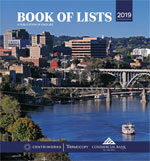 Purchase a one-time download of the 2019 Book of Lists or click the Subscribe button to purchase one year of unlimited access, unlimited downloads of all our business lists as they are updated in real-time. Create a list of sales contacts and general mailings lists, sort by company or geography, and import data directly to your desktop. Start your download now. Any questions, contact Hayley Choy at 865-342-6494 or lists@knoxvillebiz.com. A printer-friendly PDF of this list is available. A complete spreadsheet of this list is available. For advertising or sponsorship information, contact Brenda Hines at brenda.hines@knoxnews.com or (865) 342-6566.